To help you achieve the best possible look for your garden, we offer professional advice and proposals for its layout and planting. We are happy to visit you to discuss your requirements and make suggestions on ways in which you could develop your garden, dependant upon site constraints, your personal preferences and budget. A consultation (up to one hour) and plant list or plan will provide you with ideas and information to help you move the project in the right direction. Our fees start at just £50 + VAT which includes an initial visit, up to one hour and a plant list. Should you require more time spent at the consultation and / or further detailed drawings for planting purposes, additional charges will be discussed with you once the scope of the project has been ascertained. 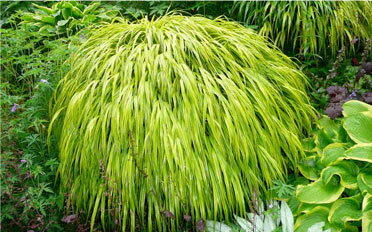 Plants recommended and used in any scheme will be Hintons' plants. Hintons will be happy to plant most things from borders to just a single tree. Included in the price of planting trees or roses is a planting additive – a naturally occurring mycorrhizal fungi. This will help the plant establish quicker by increasing the active root area considerably and also gives it better drought tolerance. Hintons offers a panel of designers to help make the most of your outdoor spaces. We can provide you with everything from personal consultation, advice and planting schemes to full garden design and construction projects. Once you’ve decided on a scheme, we can then help you to turn your ideas into reality. 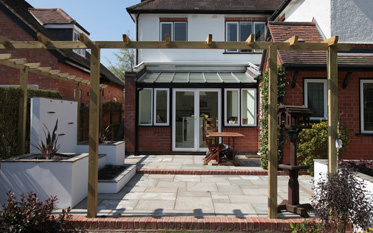 Whether it's a pergola, a patio, an orchard, a mixed border or a cherished pot, we have people who can help. To find out more ask one of our staff. 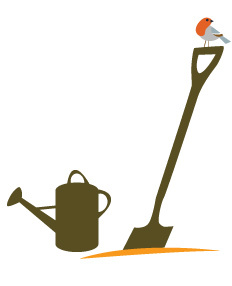 If you have a garden which has got a little out of control, or maybe you just need your shrubs or fruit trees pruning, our staff are well trained and properly insured to undertake the work for you.